For other uses, see Parable (disambiguation). A parable is a succinct, didactic story, in prose or verse that illustrates one or more instructive lessons or principles. It differs from a fable in that fables employ animals, plants, inanimate objects, or forces of nature as characters, whereas parables have human characters. A parable is a type of analogy. Some scholars of the canonical gospels and the New Testament apply the term "parable" only to the parables of Jesus, though that is not a common restriction of the term. 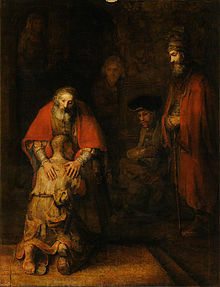 Parables such as "The Prodigal Son" are central to Jesus's teaching method in the canonical narratives and the apocrypha. Parables are often used to explore ethical concepts in spiritual texts. The Bible contains numerous parables in the Gospels section of the New Testament (Jesus's parables). These are believed by some scholars (such as John P. Meier) to have been inspired by mashalim, a form of Hebrew comparison. 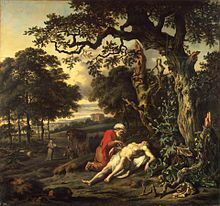 Examples of Jesus' parables include the Good Samaritan and the Prodigal Son. Mashalim from the Old Testament include the parable of the ewe-lamb (told by Nathan in 2 Samuel 12:1-9) and the parable of the woman of Tekoah (in 2 Samuel 14:1-13 ). ^ "Difference Between Fable and Parable". DifferenceBetween.com. Difference Between. Retrieved 13 June 2015. ^ David B. Gowler (2000). "What are they saying about the parables". What are they saying about the parables. pp. 99, 137, 63, 132, 133, . ^ a b Adolf Jülicher, Die Gleichnisreden Jesu (2 vols; Tübingen: Mohr [Siebeck], 1888, 1899). ^ a b Fowler, H.W. (1965). A Dictionary of Modern English Usage. London: Oxford University Press. p. 558. See entry at simile and metaphor. ^ George Fyler Townsend, in his translator's preface to Aesop's Fables (Belford, Clarke & Co., 1887), defined the parable as being "purposely intended to convey a hidden and secret meaning other than that contained in the words themselves, and which may or may not bear a special reference to the hearer or reader." However, Townsend may have been influenced by the 19th century expression, "to speak in parables", connoting obscurity.